The Asics Gel-Cumulus 16 continues to deliver with even more rear and forefoot cushioning while still maintaining its light weight feel. It features an updated version of the Guidance Trusstic System that helps guide your foot through the gait cycle. The new AHAR rubber in the forefoot allows the 16 to be lighter than any of the previous versions. The Gel-Nimbus 17 delivers a comfortable fit with the enhanced FluidFit upper that adapts to the foot for a glove-like feel. The new Guidance Tool has a vertical flex groove that enhances the gait cycle and the Heel Clutching System improves support as well as fit. 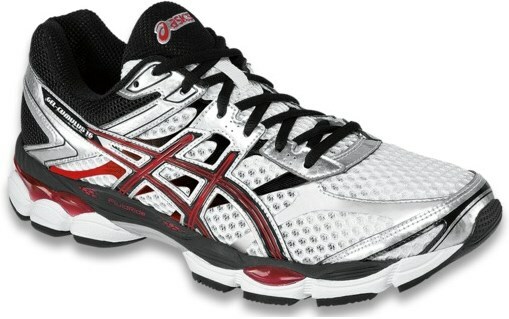 This shoe delivers excellent cushion as well with its more gel in the rearfoot and forefoot. the lightest GT-2000™ ever in the over 20 year history of the series! Much of the weight savings can be attributed to the new Heel Clutching System™ and new FluidRide™ midsole. An updated Guidance Line® and Guidance Trusstic System® complement the comfortably supportive Dynamic DuoMax® to provide mild to moderate overpronators the ultimate ride. Weight: 8.4 oz. Heel Height: 21mm. Forefoot Height: 11mm. 10 mm drop. The GEL-Kayano® 21 is updated with nothing but the best in ASICS technical innovation, featuring the next generation of FluidRide™ and a ComforDry X-40 sockliner for the lightest and most luxuriously stable ride yet. Mild to moderate overpronators will enjoy a more comfortably secure upper, uniquely designed with a new heel construction that complements the premium FluidFit® upper and Heel Clutching System™. Weight: 10.9 oz. Heel Height: 22mm. Forefoot Height: 12mm.